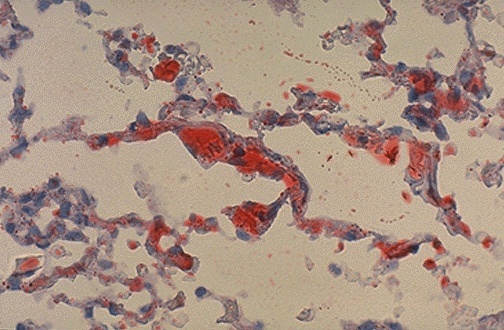 An Oil Red O stain demostrates the fat globules within the pulmonary arterioles. The globules stain reddish-orange. The cumulative effect of many of these gobules throughout the lungs is similar to a large pulmonary embolus, but the onset of dyspnea is usually 2 to 3 days following the initiating event, such as blunt trauma with bone fractures.